Author update: When this column was filed, the final decisions regarding Gamergate edits and sanctions weren’t official. Ultimately, it didn’t end up being quite what I wrote here—and it was absolutely more reaching—but effectively, I don’t think it was much better. Their response to the coverage these events received can be read here. I’d also recommend reading Mark Bernstein’s series of posts about Wikipedia and GamerGate (and this follow up), as well as coverage from The Guardian, The Verge, and other sources. THERE ARE OBJECTIVE TRUTHS in the universe, but they are few and far between. For everything else, we have Wikipedia. Wikipedia has become the de facto source for information. Stephen Colbert riffed on this idea for years with his “Truthiness” bit. It was funny because it was true. We used to look to Encyclopedia Britannica and back issues of National Geographic to write grade-school essays on Mt. Vesuvius or the human circulatory system, but now we get all the information we need from Wikipedia, and we can reasonably assume that it’s the truth. The promise of the future is finally realized! Except there’s a problem: women don’t contribute to Wikipedia. They make up less than 15 percent of contributors and as little as 8.5 percent of editors. History might be written by the winner, but truth, it seems, is mostly written by men. 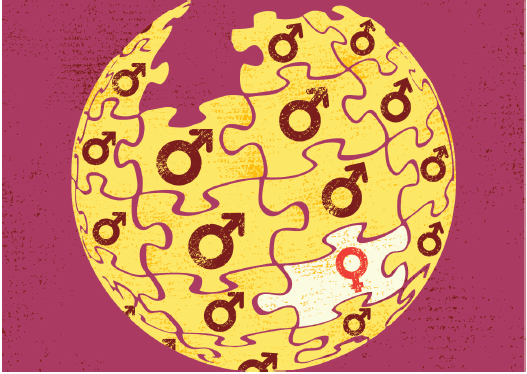 So how does gender disparity manifest inside the world’s largest encyclopedia? After all, isn’t truth absolute? As a general rule, there are fewer articles about women and the articles that do exist are, on average, much shorter. Topics that might be of more interest to women are also less extensively covered. A few years ago an editor tried to clean up the site’s list of “American novelists” by removing all the women and relegating them to a new list called “American women novelists.” On Wikipedia, as in so many other places, the default is straight and white and very, very male. To combat gender disparity on the site, Wikipedia created a Gender Gap Task Force, with the goal of getting female participation up to 25 percent. One of its tactics is to hold “edit-a-thons” encouraging women to get involved. These have had limited success since Wikipedia is notoriously difficult for (and even hostile to) newcomers. After a dispute related to the Task Force last year, the Wikipedia Arbitration Committee—a volunteer group that’s basically the site’s highest court—banned a prolific female editor after she was accused of promoting an anti-male agenda. The men she was arguing with were also sanctioned: they were told they couldn’t use abusive language anymore. In the wake of last year’s Gamergate controversy—the most modern of culture wars and, no matter what its supporters say, a debate that’s explicitly vitriolic toward women—Wikipedia became a battleground with people on both sides working to create ostensibly objective articles while fundamentally disagreeing on what the objective facts were. This is known as an “edit war” and they happen all the time, usually resulting in an article lockdown or sanctions against specific contributors/editors. In this case, it was five feminists and Gamergate critics who were banned from making further edits, leaving the pro-Gamergaters free to enshrine their version of events as truth on Wikipedia’s pages. It would be laughably ironic if it weren’t so ironically tragic. There is endless speculation on how we got here. Wikipedia has been said to foster a toxic culture with too much bureaucracy to facilitate internal change. And there are more than few accusations of aggressive misogyny. But the female participation rate of 13 percent is only slightly behind the overall rate of 15 percent in other “public thought-leadership forums.” This isn’t a Wikipedia problem, it’s just a problem. Why are women underrepresented anywhere? It’s a complex question and while we’ve gotten better at identifying the problem, we don’t seem any closer to solving it. Wikipedia’s gender gap has a detrimental effect on its content. But while Wikipedia didn’t create systemic sexism, it’s absolutely contributing to its continuation. More than that, it has a detrimental effect on society and is in and of itself both an impediment to and a sign of sexism. If owning truth (dubious as it may be) isn’t proof of male privilege, I don’t know what is. Truthiness has its own Wikipedia article. These women were eventually returned to the primary list. 5] It’s a group, unshockingly, made up primarily of men. Previous edit wars of substance include articles related to the Israel/Palestine conflict, Pluto’s ever-changing planetary status, and whether or not Darth Vader and Anakin Skywalker should be two entries or one. “Kafkaesque” is a word that’s been repeatedly used. The term “public thought-leadership” comes from the New York-based OpEd Project. I know this is true because I copied that sentence entirely from Wikipedia.